YT Industrial Services Pty Ltd. The Model Wallbank 46DP Brick Press is a self-contained, portable and stand-alone brick-making plant for the production of high quality bricks of various shapes, as well as face bricks and paving tiles. It is the only installation on the market where all units of the production process are mounted on the same platform. 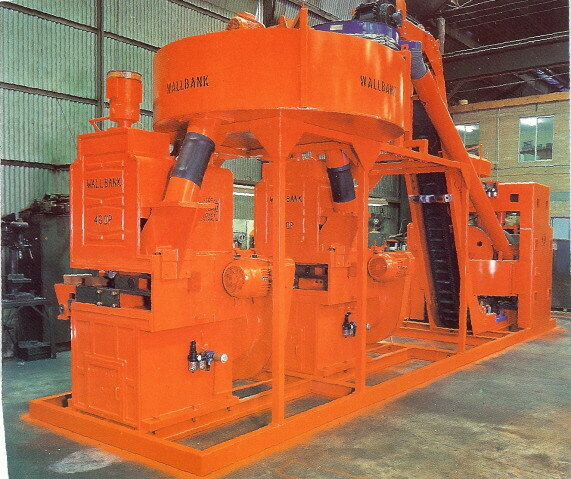 The entire process of unfired brick manufacturing is conducted within the Wallbank brick making plant, saving our customers the trouble of selecting, adjusting and matching different parts of equipment. Another great advantage is that manufacturer has 3 dimension controls over the shape of the product, which allows for the variety of products. The DB46 standard double press system has an output of 44 bricks per minute. The Wallbank Brick Plant is capable of making bricks from a variety of raw materials, available in most countries. Expansion of the product range. Supplementing the existing product range with facing and shaped bricks of various shapes and elite quality. Easy integration into existing production systems. Production of small quantities of various building materials using one plant. The production process is totally self-contained. Not supplier and infrastructure dependent. Extensive savings on transportation costs and waste reduction. Supplying bricks and tiles of various shapes and colour to developers for implementation of individual projects. Custom made products. Year-round employment in rural areas. Recycling waste into quality bricks and other products. Environmental improvement and supplying high-quality construction materials to the region.